It’s difficult to change course mid-career and educate yourself on a new subject after college has ended. For those entering the field of engineering, it often means taking coding classes or taking part in a coding bootcamp, such as those offered at App Academy, General Assembly, Hackbright Academy, and Hack Reactor. We appreciate self-starters who take their careers into their own hands. Fastly has many graduates from these programs who have become successful and valuable members of our engineering team. Below you’ll find a brief overview of the programs our employees attended, as well as their thoughts on pursuing a career in tech and getting hired at Fastly. App Academy is an immersive web development and job placement program in San Francisco and New York City. The program boasts a 98% placement rate, but if students don’t land a job as a developer after going through the academy, they don’t have to pay tuition. General Assembly, with fourteen campuses across four continents, offers full-time immersive programs, long-form courses, and classes and workshops. Their programming courses include web development, user experience design, and product management. General Assembly offers courses for students who wish to achieve personal and professional success, whether that’s advancing an independent project, adding to their skills at a current job, or transitioning to a new career. They help students with job preparation techniques and resume building, and connect them to peers and their network of more than 4,000 hiring partners. According to General Assembly, more than 99% of job-seeking immersive students find new, paid employment within 180 days of graduation. Hackbright Academy is an engineering school for women with a mission to increase female representation in tech through education, mentorship, and community. Hackbright offers both full- and part-time courses (including a Software Engineering Fellowship) for women from all fields and educational backgrounds, as well as intro classes for those who wish to increase their coding knowledge. Ninety percent of Hackbright graduates seeking employment get jobs in tech, part of which Hackbright attributes to their career services team that works with recent graduates and alumnae to help them not only get jobs, but to negotiate, evaluate policies, and navigate work situations to ensure that they thrive in their new roles. Hack Reactor offers a 12-week program that goes through CS fundamentals and engineering best practices in their “software career accelerator.” Hack Reactor students focus on building real platforms and open-source libraries both alone and in groups, as they would in a real-world work environment. They boast a hiring rate of 99%, and their curriculum is constantly evolving in response to employer and alumni feedback, ensuring their coursework stays relevant in an ever-changing field. Hack Reactor students also benefit from professional development training, giving them the ability to articulate their skills to potential employers and negotiate job offers. 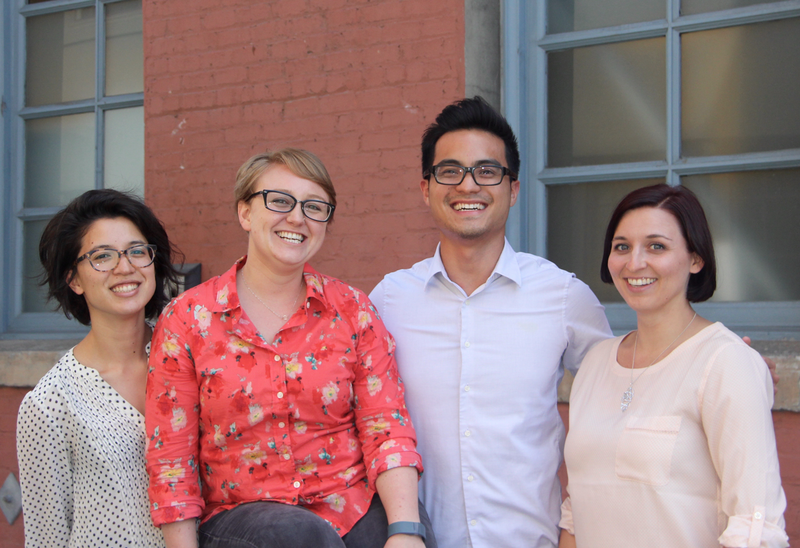 A group of Fastly engineers and coding bootcamp alums from left to right: Amy Lam, Jade Applegate, Jonathan Ng, and Emily Shea. Not pictured: Andri Antoniades, Caslyn Cole, and Cassandra Dixon. We’ve hired many engineers out of coding bootcamps, and spoke with a few of them about the programs they attended and why they were interested in pursuing a career in engineering. Most of them cited the need to change careers quickly, like Fastly sales engineer Cassandra Dixon. She joined our team after taking courses at Hackbright, a program she enrolled in to increase her technical knowledge in programming and networks. “My overall goal was to seek a technical career that supported and provided growth in learning, challenges, and opportunities,” Cassie said. Changing careers quickly was also one of the main reasons Jade Applegate enrolled in a full-time course at General Assembly. Jade, who later was hired at Fastly as a UX engineer, wanted to begin working as an engineer as soon as possible. Jonathan Ng is also on Fastly’s UX team, joining us after taking the program at Hack Reactor. He chose coding bootcamp because he “wanted the most productive career change.” This was also the case for Emily Shea, a systems engineer at Fastly who was previously working in human resources. Emily felt as though a career change to tech would offer “better job security, better pay, and potentially a more rewarding career.” Although coding bootcamps were new at the time, she opted to make the career jump and enroll in App Academy. Another Fastly UX engineer, Amy Lam, enrolled in Hackbright after joining an early stage startup, where she “wore many hats — mainly dabbling in UX and product design.” After working closely with a developer on the beta launch of their product, she decided to learn to code. “What I have always enjoyed most in my career is building things and solving problems,” she said. Changing career direction is never easy, and going back to school to take on a new career can prove challenging all on its own. Here’s some advice from our engineers who went through coding classes before switching careers. Don’t be discouraged by the overwhelming coursework. Emily noted that “keeping up with the course materials and managing the time commitment” was among the biggest challenges of doing a coding bootcamp. The course was non-stop, and topics moved quickly, offering little opportunity to catch up if you fell behind. “It was the most challenging learning experience I’ve had because of the low tolerance for error and the fast pace,” she said. Emily advises those interested in such a program to “not get discouraged by what you don’t know. Everything you come across that you don’t already understand is an opportunity to learn.” She emphasizes the importance of not being right all the time, but to see pitfalls and challenges as a chance to learn and grow in a newfound career in tech. “Thinking of it this way helped me to not get discouraged and be less afraid of failure,” Emily said. Don’t get frustrated if things don’t come easily. Amy told us that one of the biggest challenges she faced during her time at coding bootcamp was “not getting frustrated and giving up when things aren’t working.” Learning a new skill takes time, and it’s important to be patient with the learning process. She advises prospective bootcamp students to “code as much as you can prior to the program.” Amy is a major proponent of the “10,000-Hour Rule,” Malcolm Gladwell’s claim that the key to achieving world-class expertise in any skill is to practice it for 10,000 hours. Mentally prepare for the grueling interview process. Cassie acknowledged that the interview process was challenging: “You’re competing with a large pool of engineers at different levels of their careers. You go through highs and lows emotionally and mentally. However, I believe people who attend these programs have a deep sense of drive and determination.” For Emily, the interview process post-bootcamp was “pretty intense and grueling, but also exciting.” She applied to 200+ companies in the two weeks after graduating, and had fourteen in-person interviews in ten days. “It was exhausting to reimagine my future with each interview,” Emily said. “Will I get to know these people? Will I work on this project and learn this technology?” She ended up with offers from six different companies. Give yourself time to adjust. Jonathan equated searching for a job after his program to when “you just graduate from college and you are taken aback by jobs, interviews, and how the real world really works.” Going from bootcamp to real world was a transition like any other, and subsequently took some adjustment. Emphasis on personal growth and mentorship. Jonathan valued Fastly’s “emphasis on personal growth” which included a great culture and opportunity for mentorship. These were all the things Jonathan wanted coming out of a coding bootcamp. Customer Support Engineer Kami Richey built an application for testing Fastly. In this post, she walks you through setting up your own test application and using Fastly’s UI to explore commonly used features first hand…. In this Q&A, Fastly’s Michael May and Heroku’s Peter Cho discuss the benefits of Fastly’s Heroku add-on and why it’s important for enterprises to focus on both developer and customer experiences.